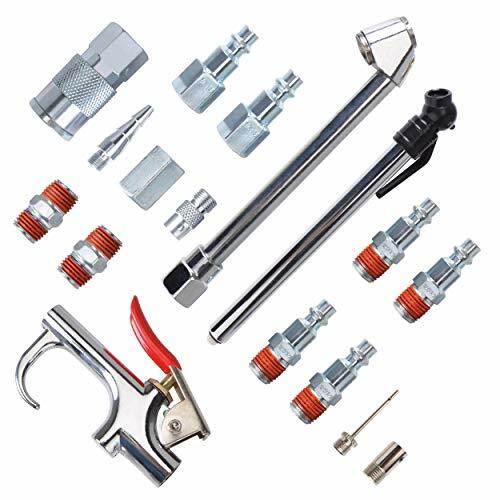 PowRyte 17-Piece Air Compressor Accessory Kit is perfect for multi-purpose use, including air dusting, inflating, pressure checking, and airline connection. It has all the most commonly used air compressor accessory items in one set. The safety blow gun (also called a air nozzle blow gun) and air accessories easily blow away dust and debris to keep the work area clean. Use the dual head tire chuck to inflate car tires, truck tires, tractor tires and bicycle tires. Use the tire inflation needles/nozzles to inflate pool toys, sports balls and air mattresses. Use the pencil tire gauge to measure tire pressure and make sure tires properly inflate. Heavy duty 1/4" industrial interchangable quick air coupler, air plug, and connectors are for air line or air tools connection.